Brian led the judging at the E-Learning Showcase at the 2016 ATD Houston Tech Conference. The project benefited the Houston Food Bank by producing compliance training courses. Brian and Sean presented at the Torrance Learning xAPI Party in Chelsea, Michigan, and again at the Torrance Learning Download the following day. 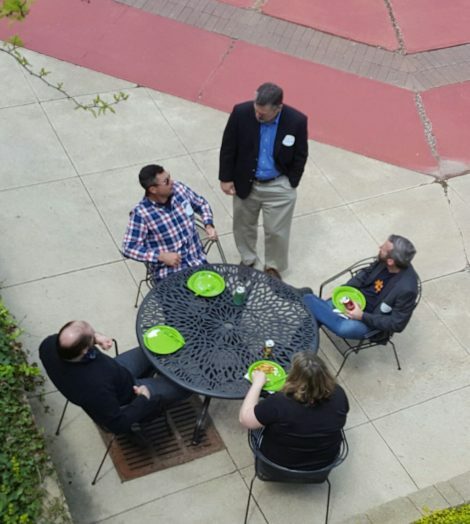 We enjoyed the events and the quality discussions around xAPI and how we can implement it. Sean presented on the basics of xAPI statements and the state of xAPI in the rapid development tools. Brian spoke about our experience creating LearnxAPI.com and gathered great feedback for future additions to the site. At the Download, Sean and Brian presented some of the good, bad, and ugly things we have seen in course reviews. Attendees joined in an energizing discussion and shared some of their own examples. Thanks to Megan and the rest of the Torrance Learning crew for hosting these events – an excellent opportunity for networking and building the community. Links to our presentations and others at the events can be found here and here (or use the direct links below). Co-development work with one of our clients continues, including storyboards, interaction prototypes, and visual design concepts. We will soon begin preparing them for developing the courses in Captivate. This has been an exciting opportunity to teach and coach as they grow their internal learning and development team. Last weekend was our first company retreat. Sean and Brian met in a secret location with a large supply of sticky notes and sharpies to brainstorm, plan, and create value for our clients. Stay tuned for more about what we learned! Moqups Update – Improved collaboration, markup, and commenting. Excellent! Connecting the Digital Dots – Becca Wilson writes about her experience creating learning experience for digital product management teams. Innovator Interview – Art Werkenthin from RISC is interviewed about CMI-5, LMS’s, and and a look to the future.